I want to buy this coffee maker, I have been searching for it in Thailand with no luck, I thought it was Vietnamese, but when I go to Vietnam I could not purchase. One very large reason I am wanting to get the stamp at the Cambodia border is to try to buy about 100 of these coffee strainers of filters. It is perfect for the traveler that wants coffee or tee. Sits on a cup, has a filter in the bottom and in the plate that strains the coffee. Better than the cloth ones because you can clean it, but still small enough to carry. I am hoping when I go across the Hat Lek border here in southeast Thailand I can buy one. I got this photo out so I can show vendors. The make this coffee with condensed milk in the bottom. I tried to find this on my site, need some search words. 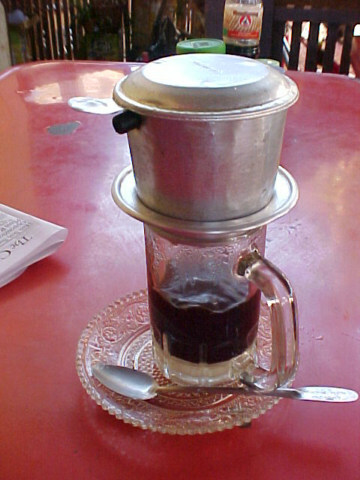 Coffee Filter strainer strain filters siem reap phom phen cambodia cafe restaurant.... so I can find it again with google.com search.